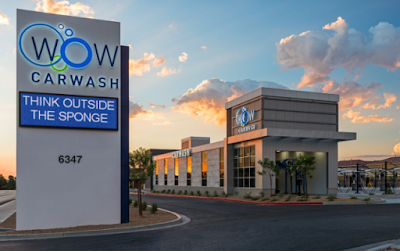 Las Vegas is the first city in country to get the WOW Carwash. They already have plans to expand in Las Vegas with another location in January. Grand opening and ribbon cutting is on Today, Sept. 8 at 11:00 a.m. As part of its grand opening, WOW will be offering free carwashes for one week, from today Friday, Sept. 8 to Thursday, Sept. 14. WOW Carwash is definitely not your everyday carwash as they offer the new wave of carwash technology with eco-friendly solutions and energy-efficient practices. WOW Carwash’s promise is to get every car super clean and dry — affordably, conveniently and quickly. This new wave of car wash technology includes a longer wash tunnel, brightened with oversize windows and equipped with high-powered sprayers and cleaning brushes that Wainwright says are designed to clean "thoroughly but gently." A reverse osmosis, mineral-free rinse system is engineered to eliminate water spots—a curse of many conventional carwashes—and self-serve vacuum stations incorporate high-suction/low-noise technology. The eco-friendly equation at WOW includes biodegradable cleaning solutions, formulated to be environmentally safe in the municipal water system, advanced energy-efficient cleaning equipment. WOW's high-tech water filtration and reclamation system makes the most of every drop. In fact, 80 percent of their water is recycled. Don't forget - FREE carwashes today through the 14th!